I have been working independently, i.e. not in an educational institution, for the past 12 years, so my take on this week’s content of Week 3 of the openedMOOC is probably not typical. Much of the discussion is about the re-use capabilities of open educational resources (OER). Stephen Downes has pointed out that this discussion pre-supposes that you have access to the OER in the first place, and we know that quite often the resource is only accessible if you pay for it. On a personal note, I am currently trying to decide whether to pay for a research paper a colleague and I are working on to be openly accessible in the journal we think is the best fit for the work! That could be a whole discussion in its own right. But I have worked in a Higher Education institution and in schools in the past, so the issues being discussed this week feel familiar and, for those currently working in these environments, the course provides helpful resources to make sense of the difficulties associated with ownership of the materials produced when working for an institution. (See Week 3 in http://linkresearchlab.org/openedmooc/ ). 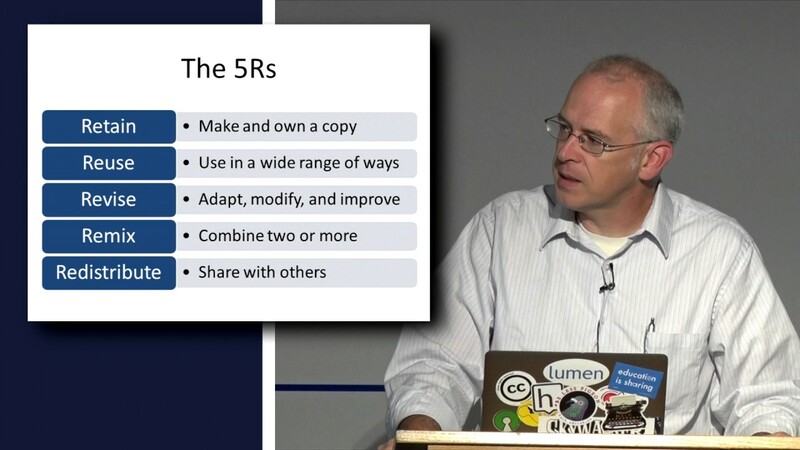 However, he points out that it is not possible to apply these 5Rs to resources you do not own, such as a textbook. So what is the incentive for University lecturers and teachers to create their own OER? What would be the incentive to write a textbook and then make it openly accessible, free and re-usable in terms of the 5Rs? At many institutions, this would require a cultural change and depend on the roles that lecturers play and the type of students that the institution attracts. If a lecturer’s role is to teach adequately, bring in funding and raise the prestige of the institution through high quality research publications, and if the institution serves upper middle class students, then there is little incentive to spend large amounts of your own time creating OER. There is much more incentive for lecturers in institutions where the students will struggle to pay for their education. Are traditional rights still being protected at your institution? How do online materials factor in? Is your institution making investments in building better course materials? How are faculty being ensured the right to continue to use the materials they have authored? How is your institution ensuring that educators and learners can make continued use of resources? What happens at your institution if multiple educators and development teams want to expand on and improve materials especially over and expanded time period, e.g. years? How can an open approach simplify these concerns while also making a larger contribution to the commons? David Wiley suggests that we need to pull together pockets of individual practice and collaborate on the creation of OER which could then be further developed by future teams of collaborators. This would reduce the workload for individual lecturers and also mean that lecturers don’t have to keep reinventing the wheel. Of course, collaboration in itself is a sophisticated skill that doesn’t come easily to everyone. I did wonder, whilst going through all the materials for this week, how much time David and George spent on creating these resources and how they managed to persuade edX to allow them to host them on an independent site. What’s in it for edX? And indeed what’s in it for them? This week’s videos and readings are a lot more interesting than I anticipated. David Wiley and George Siemens introduce the topic in an informative three part video in which they point out (as does Stephen Downes in his video) that whereas in the past a resource creator had to register for a copyright/patent, these days anything that can be fixed in tangible form is automatically copyrighted at the point of creation and anything created is owned. As Stephen Downes points out, this begs the question of what is not owned – Ideas? Software? Algorithms? How does something come to be in the public domain? This question led to a discussion of the meaning of the Commons and the idea that a resource can be shared in common, i.e. a resource is managed collectively by the community. For example, a village green could be used by any member of the community for the grazing of stock and collectively cared for by the community. The ‘tragedy of the commons’ is that they tend to become abused, closed and controlled by people whose self-interest works against the common good. This is not only seen on village greens and the like, but also in education settings even in those environments which claim to be open. For example people in networks tend to gather in groups/cliques which, whether intending to or not, can exclude. Elinor Ostrom points out that exclusion of beneficiaries is costly and that ultimately the short-term interests of a few are not in anyone’s long-term interest. It seems then that it’s likely that if we hold a resource in common, someone will abuse it and the question of ownership will never be very far away. So the question, why should you share, remains an important one. Why shouldn’t the original creator of a resource retain ownership of his/her creation? These questions stir up a lot of emotion and controversy as seen in some of the readings suggested for this week. But now that the Internet has given us a world without distribution costs, it no longer makes any sense to restrict sharing in order to pay for centralized distribution. Abandoning copyright is now not only possible, but desirable. Both artists and audiences would benefit, financially and aesthetically. In place of corporate gatekeepers determining what can and can’t be distributed, a much finer-grained filtering process would allow works to spread based on their merit alone. We would see a return to an older and richer cosmology of creativity, one in which copying and borrowing openly from others’ works is simply a normal part of the creative process, a way of acknowledging one’s sources and of improving on what has come before. And the old canard that artists need copyright to earn a living would be revealed as the pretense it has always been. This stirred up a hornet’s nest with some angry responses in the many comments that his article generated e.g. Sorry, I am a creative professional. I would, and will copyright my work. Yes I want to get paid for it. It’s my job why shouldn’t I? I think it’s dumb to just give away everything you work hard for. That is what you are doing when you choose to not protect your work. You leave it open for everyone including pirates. I have cherry-picked from the comment here, but I think it illustrates that ‘open, free, sharing’ is not desired by all. The darkest side of this sharing narrative is that consumers and the short-term contracted labour force are fed the idea that they are participating in a new democratised economic order. The sharing economy is just part of a sales pitch, and a way of dressing up inequities and dodgy business practices. ‘Sharing’ is one of the most rhetorically abused virtues of the age. At best, it [the sharing economy] entails a raft of technologies and business practices that disrupt some of the usual ways of thinking about work, service, and the economy. That can’t be all bad. He thinks that maybe the idea of a sharing economy is not served by naming it as such. I have also often thought that the idea of sharing is not well served by the language that is sometimes used to discuss it, e.g. sharing = caring etc. There needs to be more balance between the rhetoric and the reality of what ‘sharing’ means. 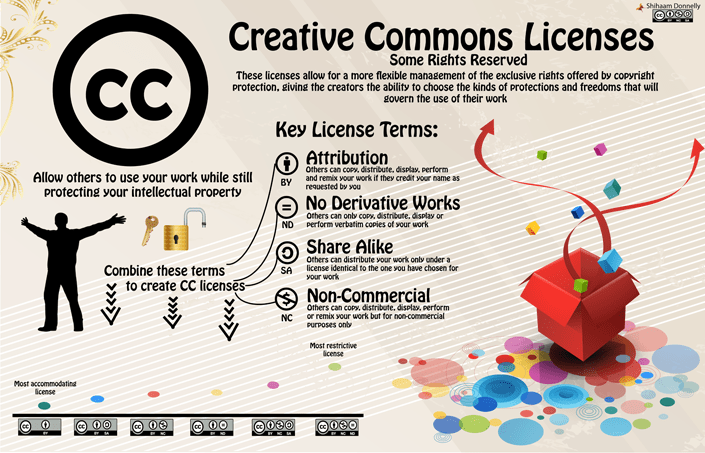 A way of retaining ownership and control over how, and under what terms your ‘creation’ is shared is through the use of Creative Commons copyright Licenses. In a video created by Henry Trotter from the University of Cape Town (see Week 2 content), he points out that copyright can be different and mean different things according to where you live. David Wiley and George Siemens see Creative Commons licenses as a means of overcoming these differences and making the whole process of sharing resources a lot easier, since you then don’t have to seek permission from the original creators. I have a copyright license on this blog and also on my Flickr site, but I don’t monitor this and I’m not convinced that people coming to these sites adhere to the copyright license. I am sometimes contacted about use of my photos and I always say yes, even if the required use doesn’t match my license. And I know from the blog stats that some posts are used in closed courses, i.e. I can’t actually see how they are being used as I don’t have a password for the course. But there are things that I don’t share. I am very selective about what personal information I share and I am very careful about sharing information in the open about my family. I find the common habit of openly sharing information about young children, presumably without their knowledge, concerning. I also don’t often share research in progress, unless I am doing a public presentation about it and then I will put a Creative Commons License on it, but I always try to publish in open journals. I agreed with pretty much everything David and George said in their video about the nonsense of publishing in closed journals with no payment, only to be charged to distribute your own work. If nature has made any one thing less susceptible than all others of exclusive property, it is the action of the thinking power called an idea, which an individual may exclusively possess as he keeps it to himself; but the moment it is divulged, it forces itself into the possession of every one, and the receiver cannot dispossess himself of it. Its peculiar character, too, is that no one possess the less, because every other possess the whole of it. He who receives an idea from me, receives instruction himself without lessening mine; as he who lights his taper at mine, receives light without darkening me. This makes perfect sense to me, but it also means that I need to be circumspect about the ideas I openly share. As my parents used to say to me – ‘If in doubt – don’t!’ Sharing is a choice – hopefully an informed choice. We don’t want you simply to repeat what other people have said. We want you to create something of your own. Remember that you are not starting from scratch. Nobody ever creates something from nothing. That’s why we call this section ‘repurpose’ instead of ‘create’. In a paper that my colleagues Marion Waite, George Roberts, Elizabeth Lovegrove and I have had published this week, we have pointed out, as others have before us, the tensions between repurposing and plagiarism. It seems to be an intractable problem for Higher Education institutions wanting to go down the ‘MOOC with accreditation’ route. A discussion in ModPo this week about Dadaist poetry and with reference to Tristan Tzara’s instructions on how to make a Dadaist poem, is closely related to ideas around open educational resources, repurposing, creativity and plagiarism. Take a newspaper. Take some scissors. Choose from this paper an article the length you want to make your poem. Cut out the article. Next carefully cut out each of the words that make up this article and put them all in a bag. Shake gently. Next take out each cutting one after the other. Copy conscientiously in the order in which they left the bag. The poem will resemble you. And there you are–an infinitely original author of charming sensibility, even though unappreciated by the vulgar herd. This video illustrates the idea for those who relate better to video than text. Is a poem written in this way an example of repurposing, or plagiarism, or both? As chance would have it, just in the past week there has been a ‘storm’ about plagiarism by two Australian poets. But in all the outrage, and the quibbling over how poets should footnote their poems, the very legitimate poetic practice called “collage” is being dragged through the proverbial mud. Other experimental practices have been implicated, too – homage, misquotation, mistranslation, and more. ….. it would be a great shame if, in our rush to lynch a couple of plagiarists and their misguided ideas of “patchwork”, “sampling” and “remixing”, we forget to remember why poetry needs experimentation. It’s Not Plagiarism. In the Digital Age, It’s ‘Repurposing’. It seems that the boundaries between plagiarism and repurposing, what is creativity and what is not, remain very blurred and a bit of a minefield. Did Tzara plagiarise the newspaper article he cut up? At what point does repurposing end and plagiarism begin? Interestingly, plagiarism has been made much of in ModPo, although, if I remember correctly, the word was not used in discussion of Tristan Tzara’s instructions on how to make a Dadaist poem. I wonder – how many poets license their poetry under Creative Commons? Of course for this to work, poets would need to publish in the open. Perhaps its ‘openness’ and all that entails that is the problem, rather than plagiarism. This week in Change Mooc – I have particularly enjoyed reading Rory McGreal’s rant. It is interesting how a bit of passion can make a topic come alive. In parallel with the MOOC topic I have myself been involved in OER issues this week. I am working on a government-funded project with a team, which is tasked to develop some educational training packages for primary and secondary schools in England. The idea is that we will write new materials, but also review and update a wide range of existing archived resources, which have been produced by the same team for prior government-funded projects. We will then filter and select from this extensive archive the resources we need to create new training packages. This is where the OER issues arise. The question is who owns these archived materials. Evidently there are millions of pounds worth of educational resources languishing in government archives, while the powers that be decide who can have access to them and whether they can be remixed and repurposed. My understanding is that this kind of archiving often happens when governments change. The funders of the project who attended the first team meeting told us that one education project had recently been taken to court for infringing copyright – a very costly mistake. So funders are nervous about OER issues, but at the same time didn’t appear to know anything about Creative Commons licenses. Fortunately one of our team is very knowledgeable about this. As an aside I often wonder if the number of Flickr accounts with ‘all rights reserved’ is through choice or simply because people are not aware of the other options. I wasn’t aware of them myself until my MOOC friend and colleague Matthias Melcher asked me why I had all rights reserved on my Flickr site. The issue of accreditation also came up in our project meeting. The training materials we develop will be used by education centres to deliver training for schools. Will the University, which has been funded to do this project, accredit this training – for example – by allowing the modules to carry 10 or 20 credits? Evidently this will take considerable time and effort to thrash out. So it has been interesting to experience first hand the issues that Rory McGreal discussed this week. It seems that perhaps the biggest challenge is educating people about the issues and raising awareness. See A Basic Guide to Open Educational Resources (OER) and Guidelines for OER in Higher Education for further information.